Taken c1890. Visible on enlargements: 2 men and 1 woman, 2 main lines plus two siding lines, wagons read "Wirksworth Stone & Mineral Co", Station name "Wirksworth", hand trolley, 14 milk churns, signs: "Suttons Seeds", "Sunlight Soap", Gas lights, and Post Box. 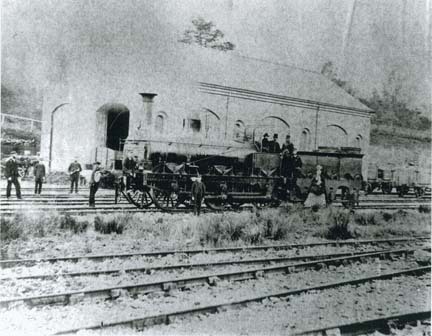 The Wirksworth and Duffield Railway opened the line in 1867. 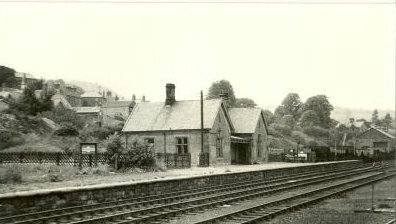 The line had stations at Duffield, Hazelwood, Shottle, Idridgehay and Wirksworth. Fares from Derby were: 1st single 2s 8d, 2nd single 2s 0d, 1st return 4s 6d, and 2nd return 3s 6d. In 1890 there were 2 goods trains each weekday and 4 passenger trains. In 1872 1,000 passengers travelled, and in 1884 21,000. 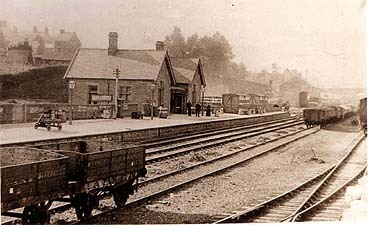 In 1885 the trip from Derby to Wirksworth took 40 minutes. The station has a twin-gabled style, similar to other stations on the line. To the North of the single platform was a goods shed. The wagons were for transporting Quarry stone from Middlepeak Quarry. Station Masters were Luke Fox 1875-1890 (see: 1881) and Thomas Cox 1890-1920 (see: 1891 and 1901 Census). 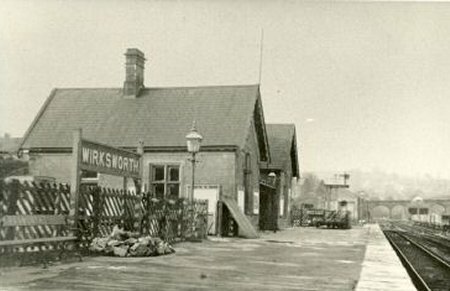 The 1891 census lists 35 railway workers at Wirksworth, with occupations such as: Station master, engine driver, fireman, stoker, guard, signalman, brakesman, porter, shunter, clerk, platelayer, goods forman, cleaner, labourer and drayman. Loco at Wirksworth shed taken about 1874. (See more). Unposted.